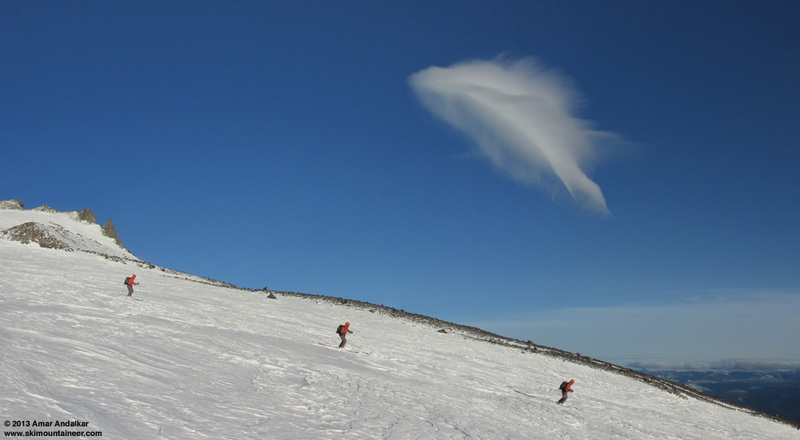 it was the spring of hope, it was the winter of despair..."
Three-shot panorama / multiple exposure of Kam skiing by an amazing feather-like lee wave cloud which formed east of the Muir Snowfield past Anvil Rock, December 25. 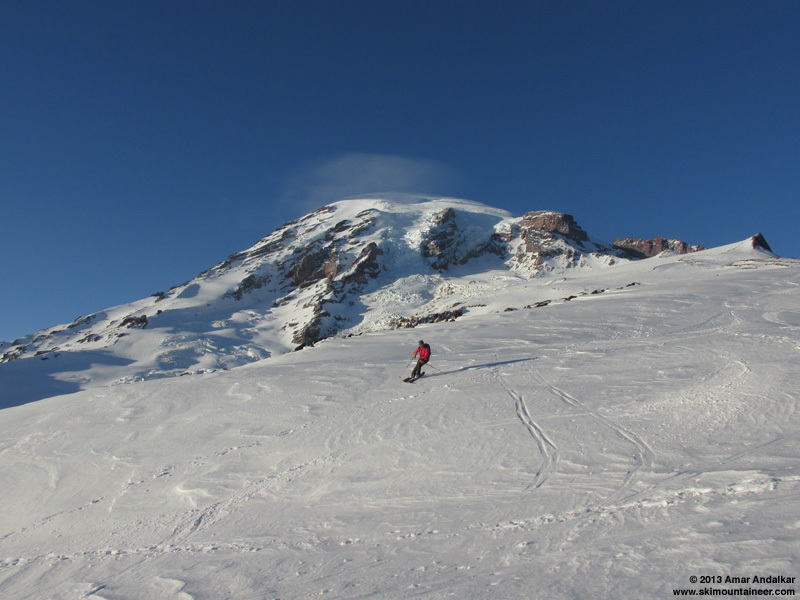 A tale of two ski trips to Camp Muir only 4 days apart, both days partly-to-mostly sunny with almost identical temperature and wind conditions, separated only by a brief period of rain and light snow halfway between, which produced naught but another smooth raincrust topped by only 1" of new snow. 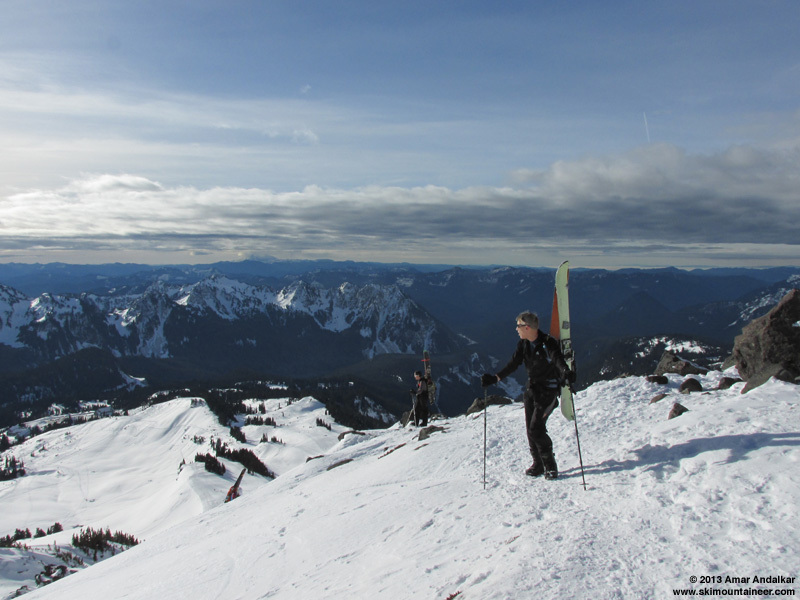 But never in the field of ski mountaineering has so little snow, meant so much, to so many -- nor made such a huge transformation in ski conditions near Pan Point! 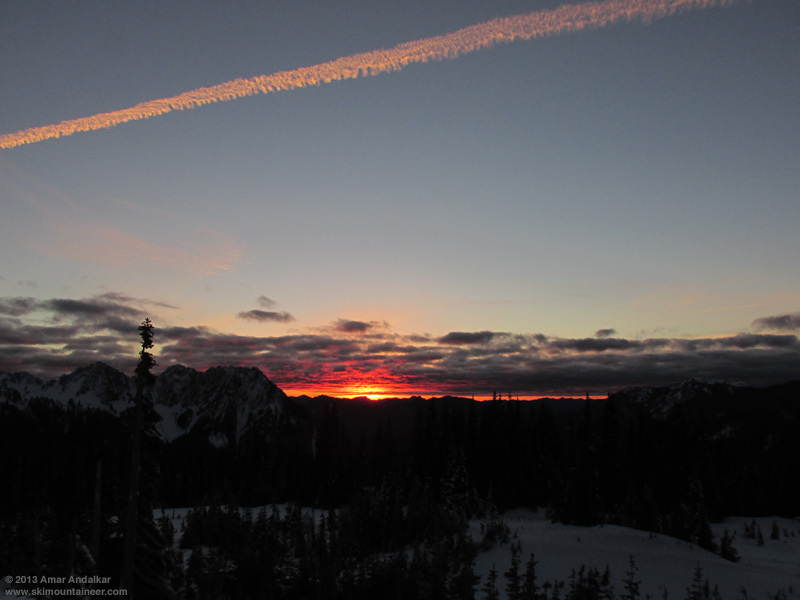 Sunrise fire and the shadow of the Mountain, both projected onto the underside of an altocumulus cloud deck, viewed from the hill south of Graham, WA, December 25. 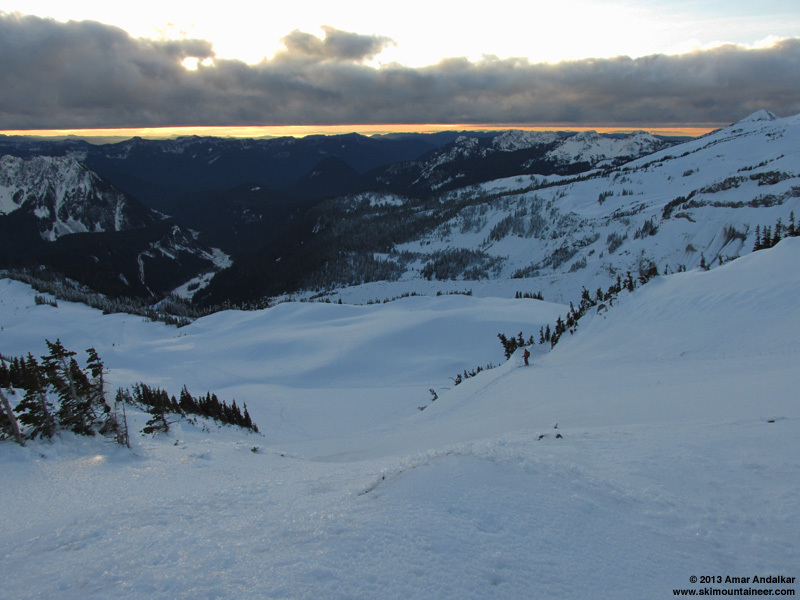 December 25: About 2-3" of powder atop a firm raincrust from Paradise up to about 6400 ft.
December 29: About 1" of powder atop a newer, firmer raincrust from Paradise up to about 6400 ft. Almost deja vu (view), December 29. December 25: Bulletproof water ice, really hard nubbly translucent ice, covering almost everything on Panorama Point and Pan Face from about 6400-7200 ft. Foot crampons near-mandatory, the falling body of a foolishly uncramponed climber suddenly sliding down the entire height of Pan Face at high speed, almost taking me out as I was transitioning -- I had only 1 foot crampon on when the missile launched itself downhill, studded with a long ice axe and 3-ft picket projecting from its pack -- but thankfully missing me by less than 3 ft, the closest I've ever come to being struck by a falling body, counting hundreds of days in the mountains including perhaps 150+ ascents of this particular Face alone. He was uninjured, pure luck given his lack of sense or skill -- I was left muttering and shaking my head. December 29: Fears of bulletproof water ice covering almost everything on Panorama Point and Pan Face, but shocked to find that the mere 1" of new powder from December 27 had somehow bonded to the water ice and covered it almost completely, with only tiny vestiges of its former fangs still bared in isolated patches. Foot crampons still highly recommended, but certainly not mandatory this time given decent boots and sufficient climbing skills. I still don't understand how that tiny bit of snow from the 27th bonded so well to the water ice at Pan Point instead of simply being blown away to land elsewhere. Cramponing up hard water ice near Pan Point, December 25. Boot booting up snow covering the hard water ice near Pan Point, December 29. 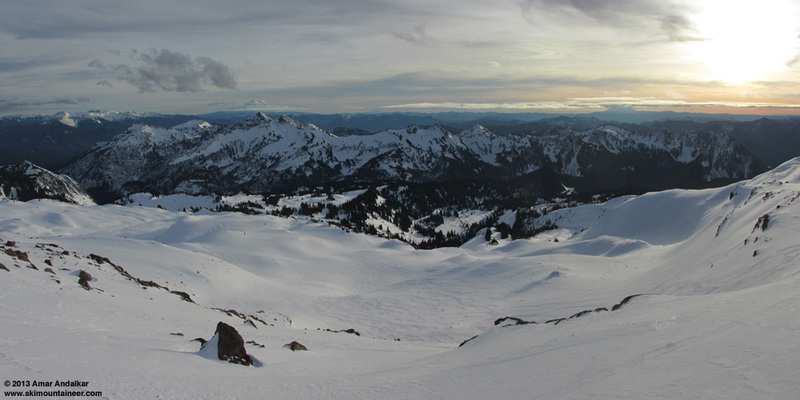 December 25: Ski crampons were great for the traversing part of the winter route from 7200-7700 ft past McClure Rock. 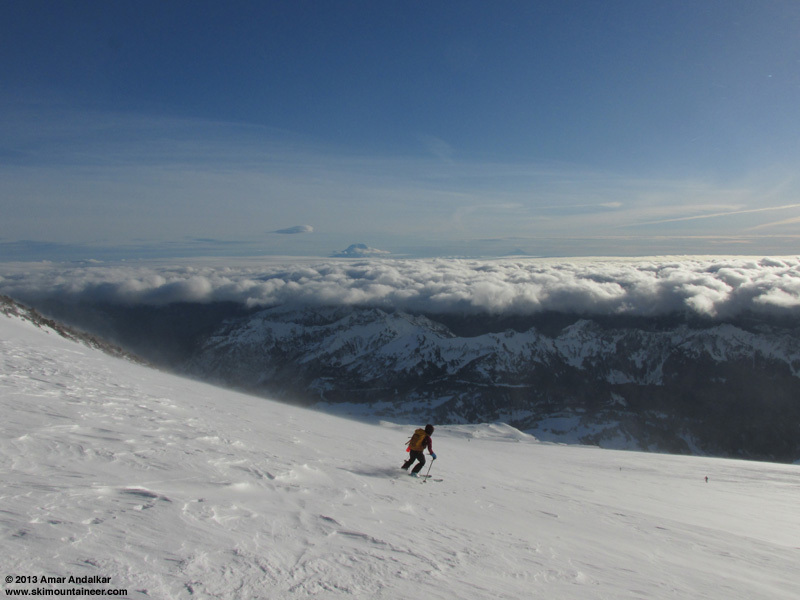 December 29: Ski crampons not needed, just 1" of smooth snow well-bonded atop the water ice from 7200-7700 ft past McClure Rock. Skinning up hard water ice along the winter route, December 25. Skinning up snow covering the hard water ice along the winter route, December 29. 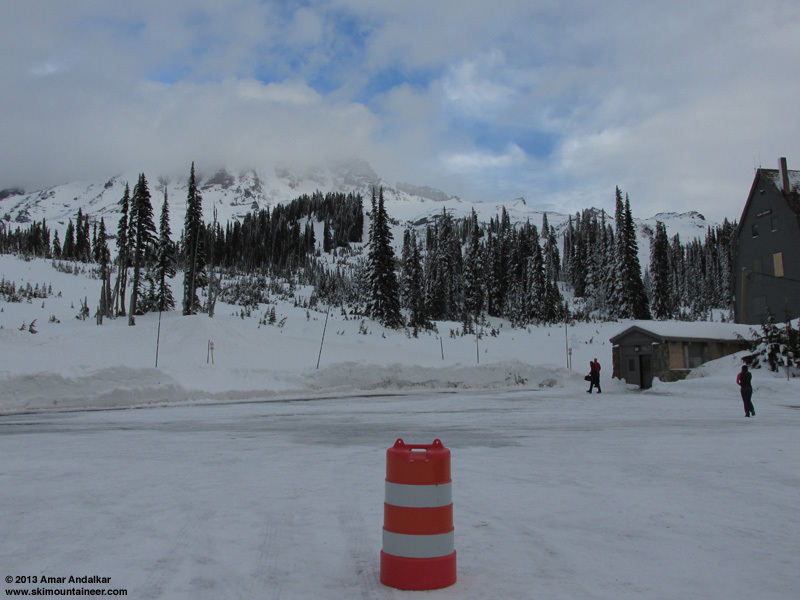 December 25: Sudden blasts of intense NW wind, 40-50 mph and sandblasting us with wind-driven snow, but mercifully interspersed with periods of near calm, from about 7000 ft all the way up to Camp Muir. 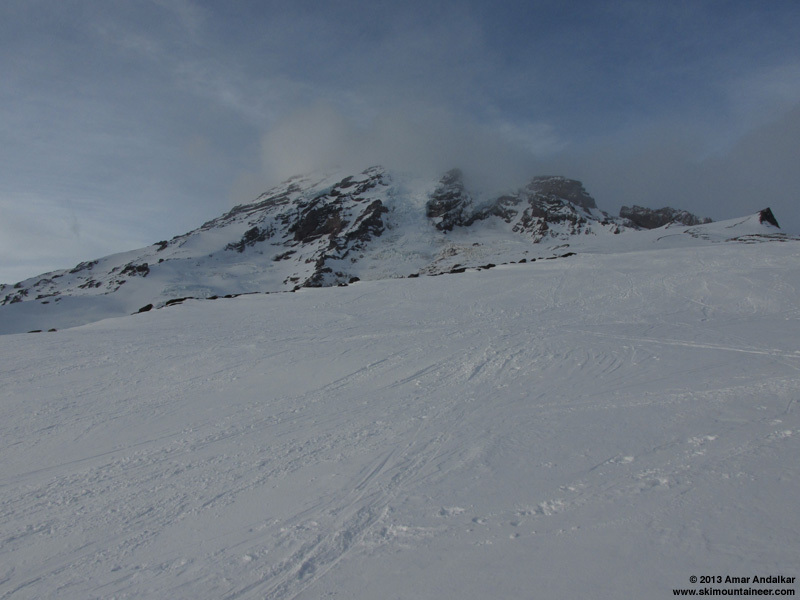 December 29: Sudden blasts of intense NW wind, 40-50 mph and sandblasting us with wind-driven snow, but mercifully interspersed with periods of near calm, from about 8000 ft all the way up to Camp Muir. 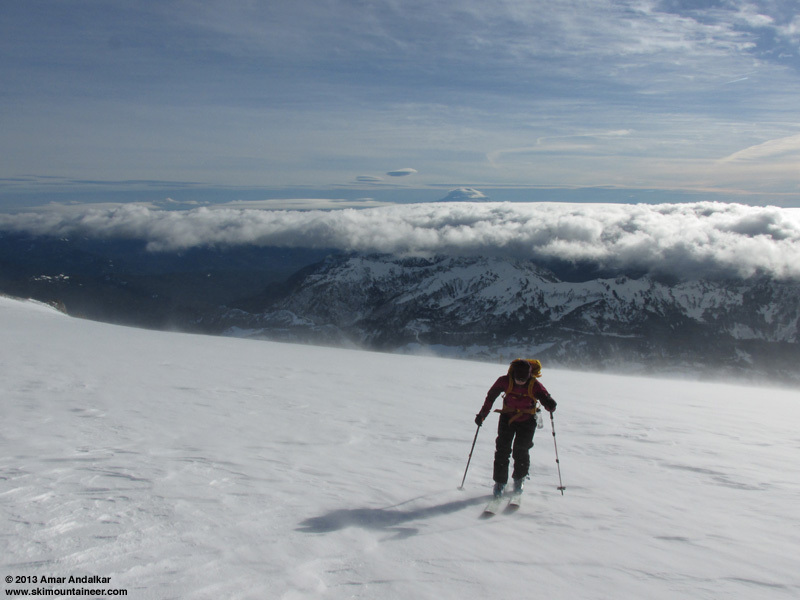 Skinning up the Muir Snowfield through gusty blasts of wind, December 25. 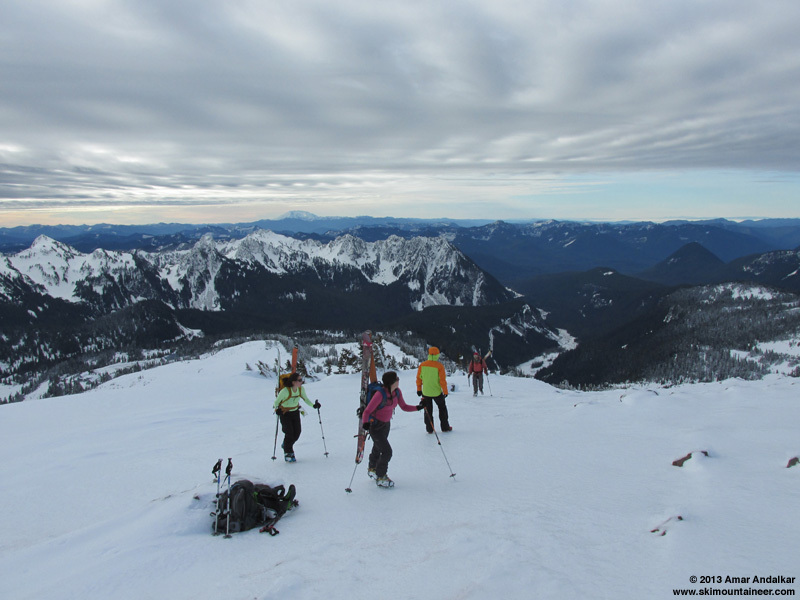 Skinning up the Muir Snowfield through gusty blasts of wind, December 29. 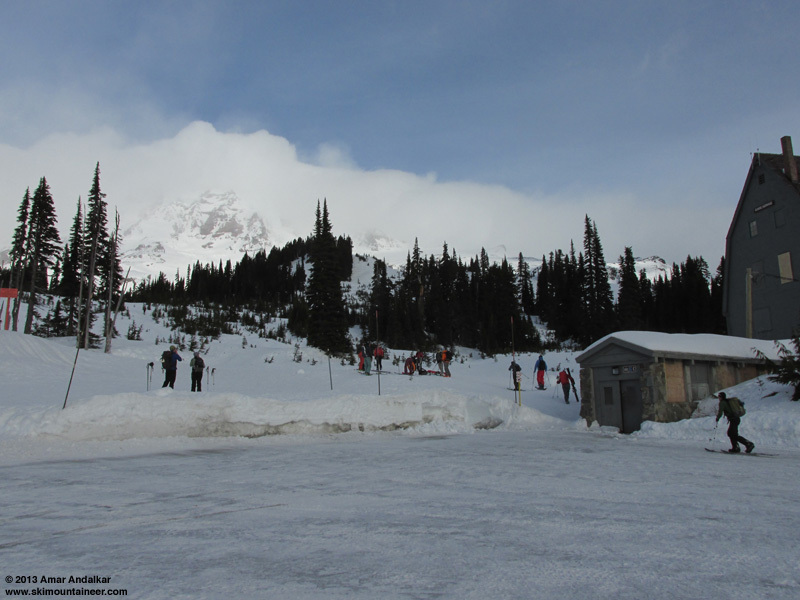 Ready to ski from Camp Muir during a lull in the gusty winds, December 25. 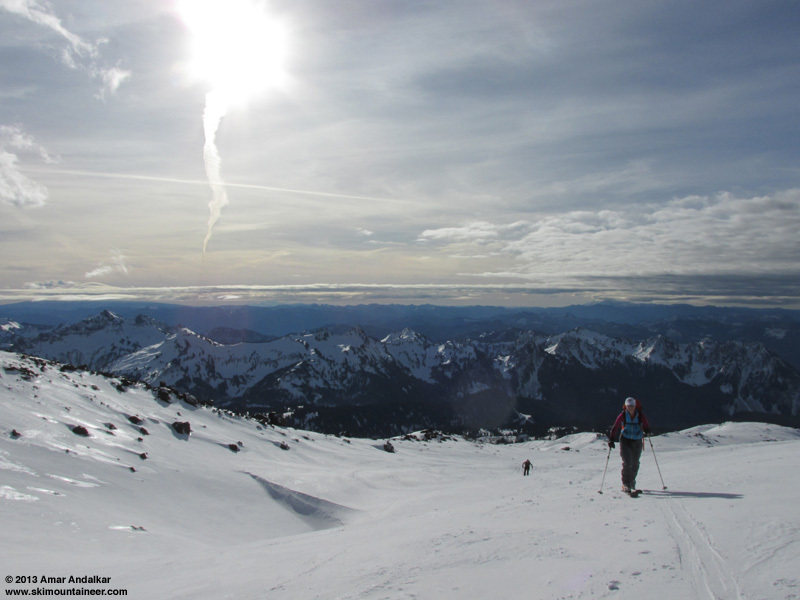 December 25: Semi-smooth windpack with nice drifts of actively-blowing powder from Camp Muir (10100 ft) down to 8500 ft, followed by excellent smooth sun-softened snow from 8400-7400 ft.
December 29: Less-smooth windpack with more sastrugi and only patches of smooth snow from Camp Muir (10100 ft) down to 8500 ft, followed by reasonably smooth sun-softened snow from 8400-7400 ft. 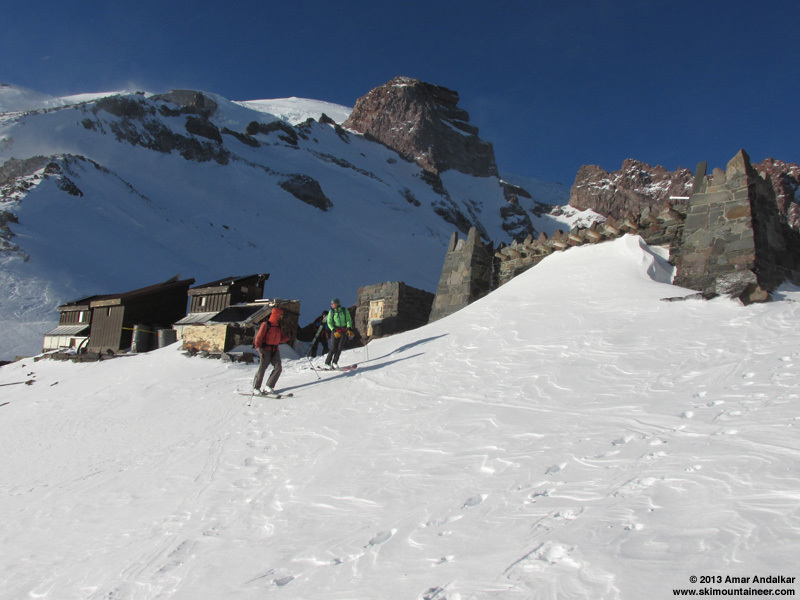 Skiing windblown powder below Camp Muir, December 25. 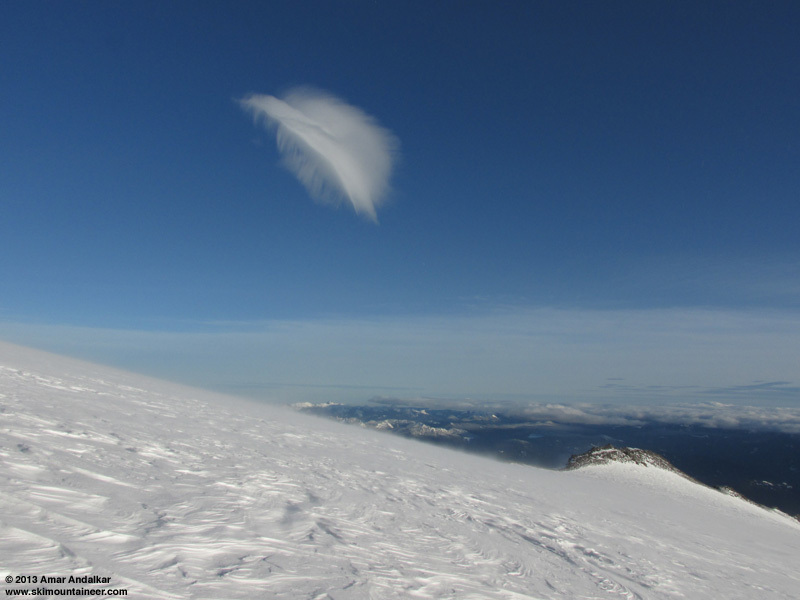 An amazing feather-like lee wave cloud which formed east of the Muir Snowfield past Anvil Rock, December 25. 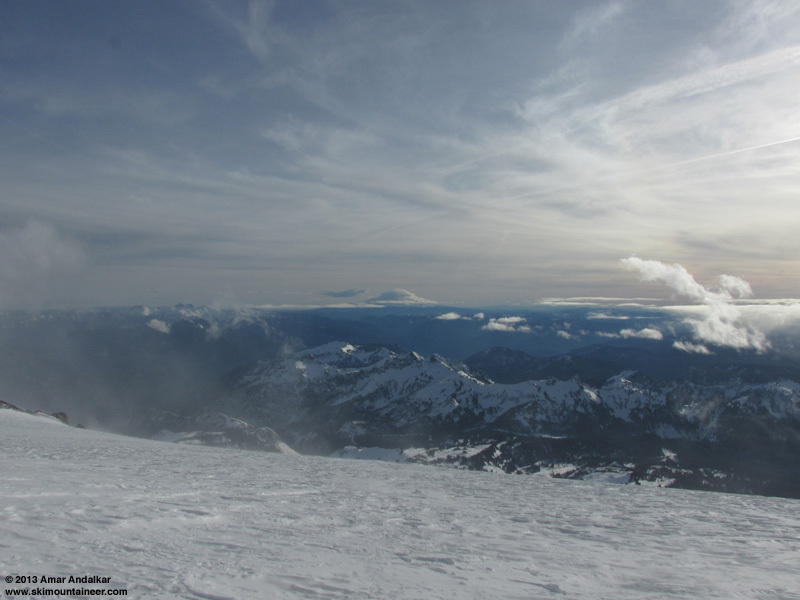 Four-shot panorama of the Muir Snowfield with Mounts Adams and Saint Helens in the distance, December 29. 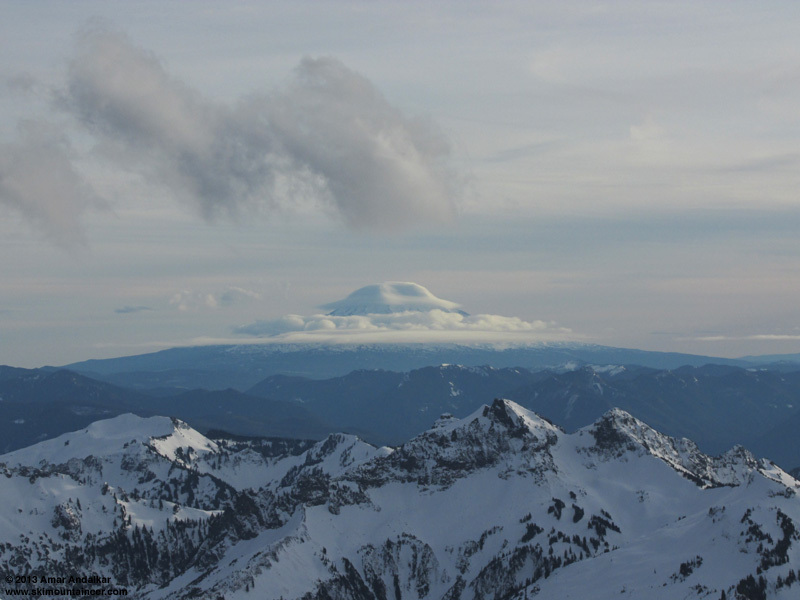 Both days featured amazing displays of lenticular and lee wave clouds, changing throughout the day into a variety of shapes and forms, on Mounts Rainier, Adams, and even Saint Helens. 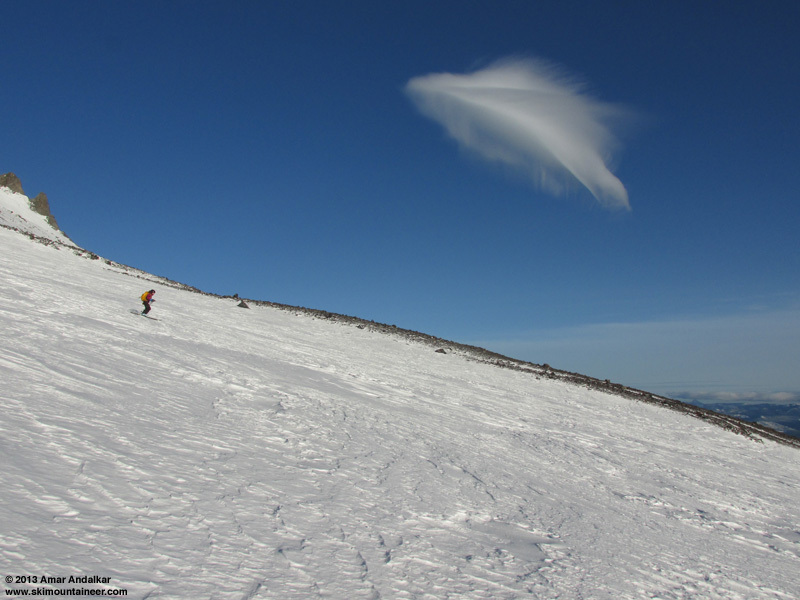 Mount Adams with a lenticular lee wave cloud, December 25. 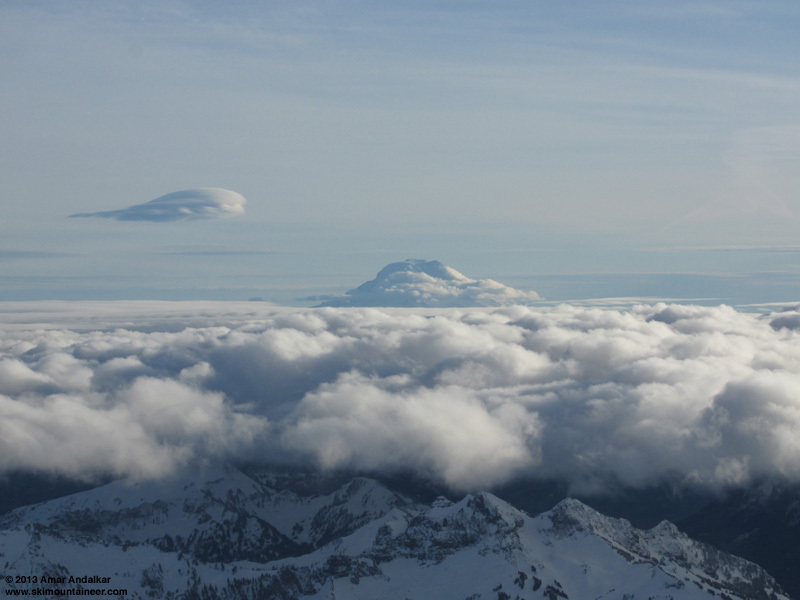 Mount Adams embraced by several lenticular clouds at various levels of the atmosphere, December 29. 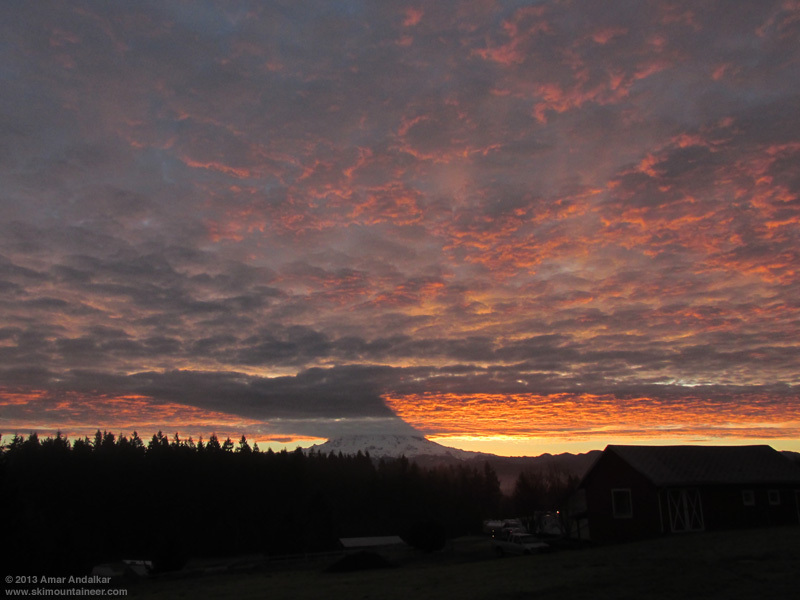 Mount Rainier with a wispy, incipient lenticular cloud, December 25. 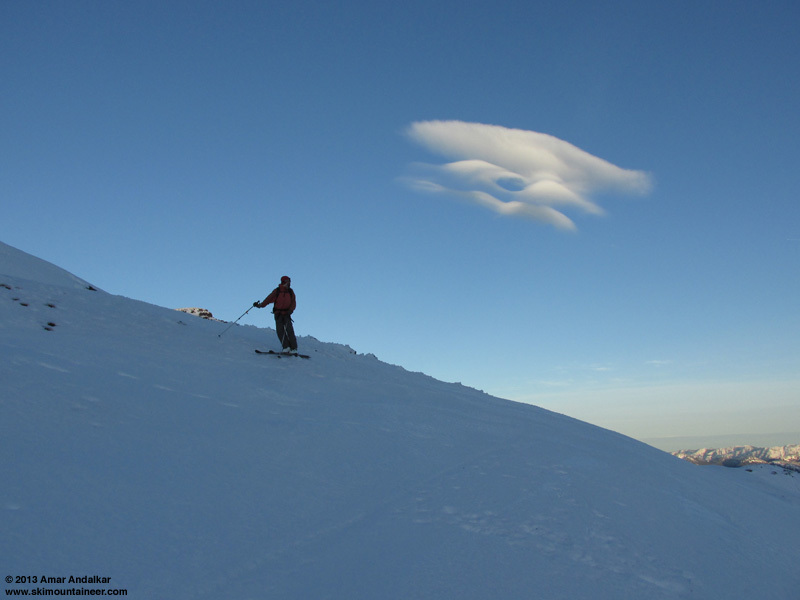 Almost the same spot, 4 days later: Mount Rainier with the puffy lenticular cloud which engulfed the summit all day, December 29. December 25: Very slick, hard water ice from 7400-6400 ft, starting above Pan Point along the winter route and extending partway down Pan Face. Truly scary and super-sketchy "skiing" (sideslipping) down the rolls and the uppermost part of Pan Face, especially given the not-very-sharp edges on my rock skis. December 29: Dropped into Edith Creek Basin near 7200 ft and found beautiful turns in 1" of powder atop a firm raincrust down to 6400 ft, lots of ski tracks but still plenty of room to find untracked freshies. Another interesting lee wave cloud formed east of Pan Point, December 25. Looking down the scary water ice of Pan Point as sunset approached, December 25. Two-shot panorama looking down at scores of beautiful ski tracks in the powder of Edith Creek Basin, December 29. December 25: Sweet turns in 2-3" of powder atop a firm raincrust from 6400-5400 ft, a welcome relief after the terrifying ice of Pan Point and Pan Face. 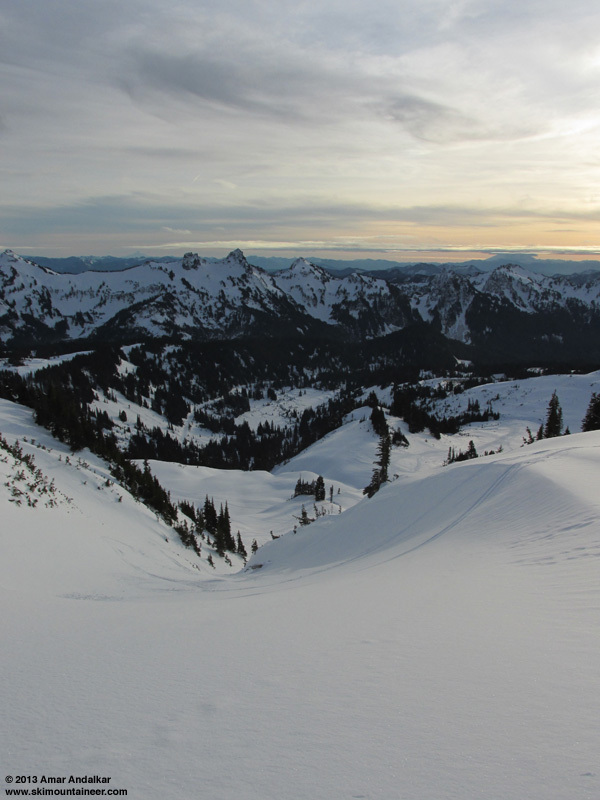 December 29: Sweet turns in 1" of powder atop a firm raincrust from 6400-5400 ft in lower Edith Creek Basin, including a steep barely-filled-in chute through the cliff band separating the upper and lower parts of Edith Creek Basin. 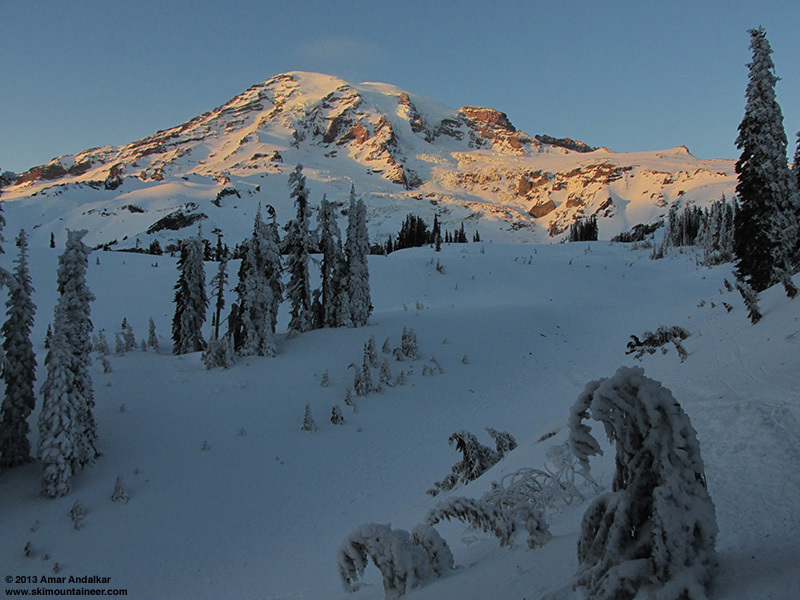 Looking back at the sunset glow on the Mountain, December 25. Looking down the chute through the cliff band between upper and lower Edith Creek Basin, December 29. 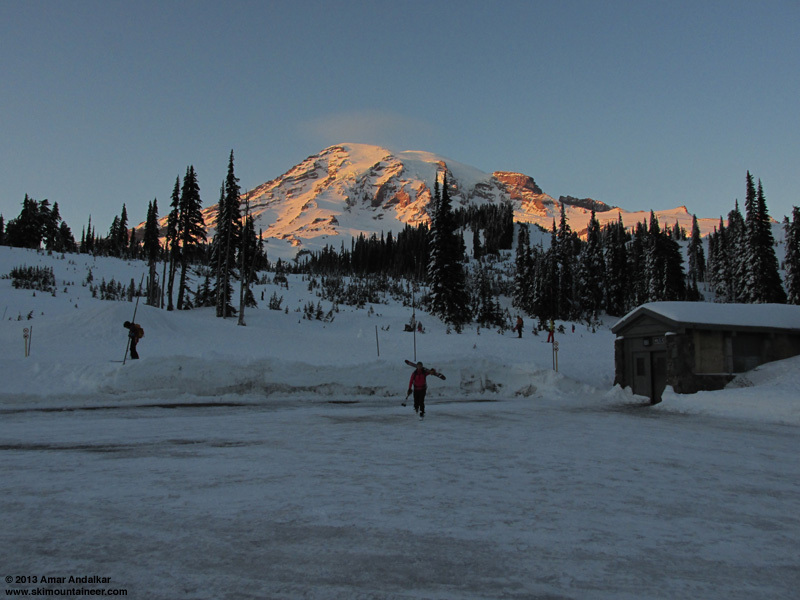 Two excellent wintertime ski trips to Camp Muir, with fine company, great views, spectacular lenticulars, and mostly good to great skiing (plus some bonus ice skating too). 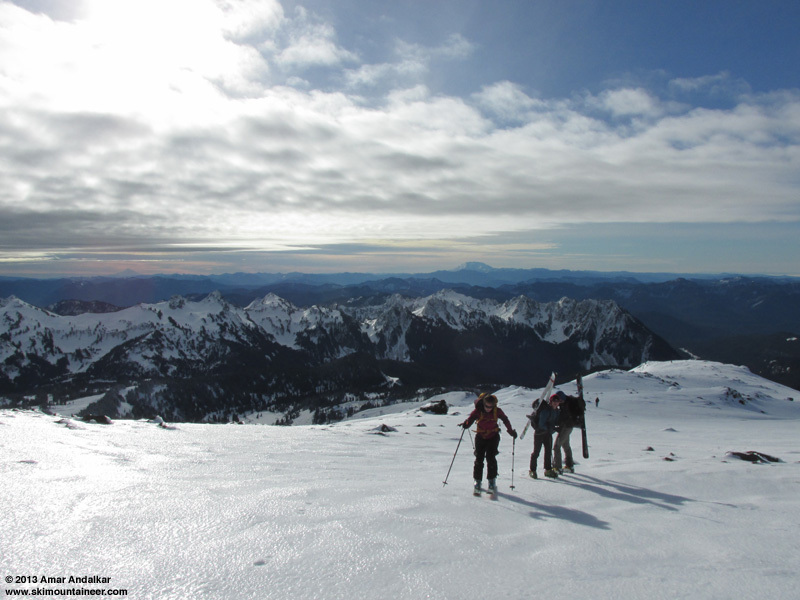 Is it really "the winter of despair" in the Pacific Northwest? Spectacular sunset in both directions, December 25. SYNOPSIS...HIGH PRESSURE WILL REMAIN OVER WESTERN WASHINGTON THROUGH THURSDAY NIGHT PRODUCING AREAS OF FOG AND LOW CLOUDS...AND HIGH FREEZING LEVELS OVER MOUNT RAINIER. A WEAK COLD FRONT WILL BRING A SOME RAIN AS IT MOVES ACROSS THE AREA ON FRIDAY. AN UPPER LEVEL RIDGE WILL BUILD OVER THE REGION SATURDAY THROUGH MONDAY FOR ANOTHER PERIOD OF FOG AND LOW CLOUDS. WEDNESDAY...SUNNY. FREEZING LEVEL NEAR 9500 FEET. WEDNESDAY NIGHT...PARTLY CLOUDY IN THE EVENING THEN BECOMING MOSTLY CLOUDY. FREEZING LEVEL NEAR 9500 FEET. THURSDAY...PARTLY SUNNY. FREEZING LEVEL NEAR 9500 FEET. THURSDAY NIGHT...CLOUDY. FREEZING LEVEL NEAR 10500 FEET. FRIDAY...PARTLY SUNNY IN THE MORNING...THEN CLOUDY WITH A CHANCE OF RAIN AND SNOW IN THE AFTERNOON. � SNOW LEVEL NEAR 7500 FEET. FREEZING LEVEL NEAR 9500 FEET IN THE MORNING. FRIDAY NIGHT...MOSTLY CLOUDY WITH A CHANCE OF RAIN AND SNOW. � SNOW LEVEL NEAR 5000 FEET DECREASING TO 3500 FEET AFTER MIDNIGHT. SATURDAY...MOSTLY SUNNY. FREEZING LEVEL NEAR 4500 FEET. SATURDAY NIGHT...PARTLY CLOUDY. FREEZING LEVEL NEAR 6500 FEET. SUNDAY...MOSTLY SUNNY. FREEZING LEVEL NEAR 8000 FEET. SUNDAY NIGHT...PARTLY CLOUDY. FREEZING LEVEL NEAR 10000 FEET. MONDAY...MOSTLY SUNNY. FREEZING LEVEL NEAR 10500 FEET. TUESDAY...MOSTLY SUNNY. FREEZING LEVEL NEAR 7500 FEET. SYNOPSIS...AN UPPER LEVEL RIDGE OVER THE NORTHEAST PACIFIC WILL BEGIN TO WEAKEN SUNDAY...ALLOWING SEVERAL WEAK WEATHER SYSTEMS TO MOVE ONSHORE THIS WEEK BRINGING A CHANCE OF RAIN AT TIMES. A MORE ORGANIZED FRONTAL SYSTEM IS LIKELY LATE IN THE WEEK. SUNDAY...PARTLY SUNNY. FREEZING LEVEL NEAR 4000 FEET INCREASING TO 6000 FEET IN THE AFTERNOON. SUNDAY NIGHT...MOSTLY CLOUDY. FREEZING LEVEL NEAR 7500 FEET. MONDAY...WINDY. MOSTLY CLOUDY WITH A CHANCE OF RAIN AND SNOW. SNOW LEVEL NEAR 6500 FEET. MONDAY NIGHT...WINDY. MOSTLY CLOUDY WITH A CHANCE OF RAIN AND SNOW. SNOW LEVEL NEAR 5500 FEET. TUESDAY...WINDY. RAIN AND SNOW LIKELY. SNOW LEVEL NEAR 4500 FEET. TUESDAY NIGHT...WINDY. MOSTLY CLOUDY WITH A CHANCE OF RAIN AND SNOW. SNOW LEVEL NEAR 4500 FEET. NEW YEARS DAY...PARTLY SUNNY. FREEZING LEVEL NEAR 6500 FEET. WEDNESDAY NIGHT...MOSTLY CLOUDY WITH A CHANCE OF SNOW. THURSDAY...MOSTLY CLOUDY WITH A CHANCE OF RAIN AND SNOW. SNOW LEVEL NEAR 7000 FEET. THURSDAY NIGHT...MOSTLY CLOUDY WITH A CHANCE OF RAIN AND SNOW. SNOW LEVEL NEAR 6500 FEET. FRIDAY...MOSTLY CLOUDY WITH A CHANCE OF RAIN AND SNOW. SNOW LEVEL NEAR 5000 FEET. FRIDAY NIGHT...MOSTLY CLOUDY WITH A CHANCE OF RAIN AND SNOW. SNOW LEVEL NEAR 4000 FEET. SATURDAY...MOSTLY CLOUDY WITH A CHANCE OF RAIN AND SNOW. SNOW LEVEL NEAR 4000 FEET. nice write-up with beautiful pics! It was the winter of despair�. I am very hopeful for a good, or at least, better spring. Great story Amar. I enjoy your keen observations. Thanks for the wonderful pictures, particularly the sun set shots. Nice report, Amar. I'm glad to hear the new snow has bonded to that ice. Let's hope for some of that on Hood.